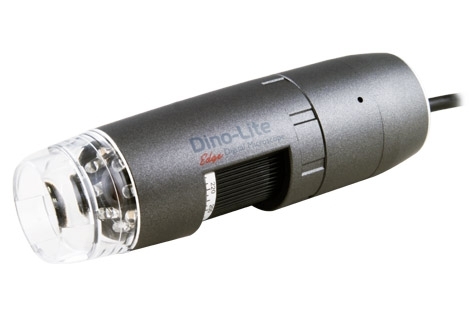 The Dino-Lite AM4115-FKT handheld digital microscope features 780nm infrared LED lighting. The AM4115-FKT views and records images at 1.3 Megapixels which lets you view objects with great image quality. This model can magnify at various magnifications depending of distance with a maximum magnification of 200X. It also has an amazing yet easy to use MicroTouch trigger (touch sensitive static sensor). The MicroTouch feature on the handheld digital microscope gives users the option of taking a picture right from the scope itself. The MicroTouch was designed to minimize image blur while taking a picture with the microscope. Great for those moments when you need to take a picture, but having a hard time reaching the computer. Included with the Dino-Lite handheld digital microscope is a copy of the "DinoCapture" software, enabling you to "capture" either a photograph, video, or time-lapsed video within a few simple clicks. This model comes with the full version of DinoCapture software which includes measurement and measurement calibration for greater precision work. As for all DinoCapture software though, updates with improvements to the software is always free. *The AM4115-FIT handheld digital microscope features 850nm infrared LED lighting. *The AM4115-FJT handheld digital microscope features 940nm infrared LED lighting.